It is annoying when you are not totally happy with something, however, I think you are being over critical. 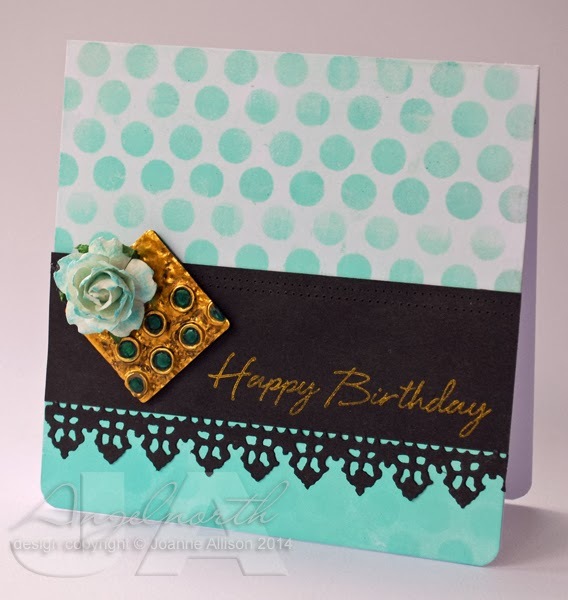 I think it is a lovely card and I love the embellishment. It is unusual, original and very distinctive. That is beautiful and really clever. Especially the copper topper. Beautiful! Clean, crisp, and I love the relation of the dotted background to the focal point, so cool! I love the meal embellishment and think it adds to the card. Love the colours you have combined. It sure turned out a beauty Joanne, thanks so much for joining us over at PCB and good luck.